This ritual will assist you in creating a sacred container to address your daily concerns. With this Spiritual Request Box, you will develop the art of turning things over to the Universe for help, direction and resolution. Small sheets of paper (like post-It notes)& pen. Preparation: Select a container to use as your Manifestation Box, or create/decorate one especially for this purpose. Wear aqua or purple clothing, and play instrumental jazz or soul music in the background. To initiate the box, this ritual is best performed on a Sunday or during the new and full Moons. Once established, you can use this box whenever you feel the need, as often as you like. The Ritual: Begin by lighting your incense, then using the incense wand to light the white candle. Next, take the incense wand and pass it around and inside your Manifestation Box or Bag, blowing gently to direct the smoke around the entirety of the box or bag to bless and "charge" it with spiritual power before use. 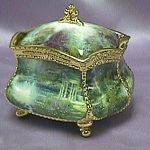 Then place the "charging" aquamarine or amethyst stone inside the box or bag and close it. On the small pieces of paper write your requests, concerns or questions to the Universe. At the end of each request, write these words: "And I will do my part". (Usually our part is staying out of the way!) Sign and date it, fold in half and half again, and drop it into the box. Repeat this process until all your current concerns are addressed. Blow out the candle. Place the box or bag in a special place where it will be undisturbed until the next time you have a request to add to it.